Do you enjoy new and exciting scuba experiences? 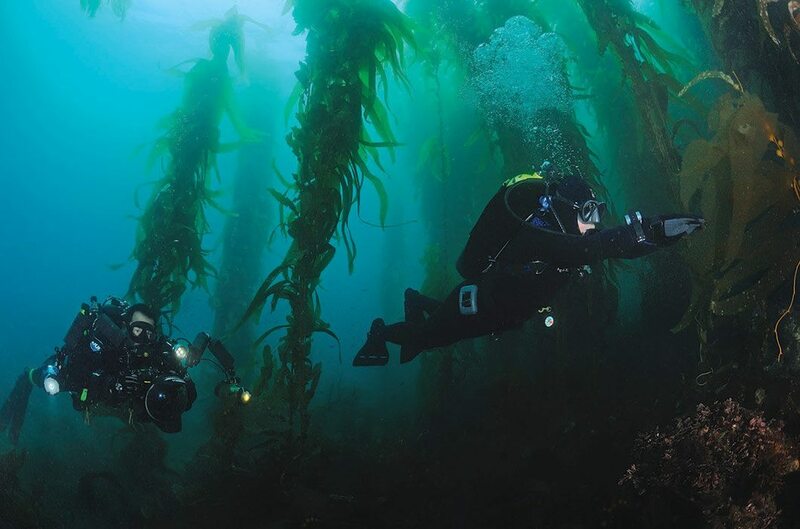 If you haven’t ventured into a kelp forest, you might want to add it to your diving “to do” list. The term kelp refers to a number of species of brown algae. Kelp is composed of the rootlike holdfast, which anchors it to the bottom of the ocean; the stalklike stipe, which grows toward the surface from the holdfast; and broad, leaflike blades that extend upward and outward from the stipe. Stipes and the blades that grow from them form fronds, which are buoyed by balloon-like, air-filled bulbs that float the fronds on the surface where the plant gets its daily fix of sunlight. The holdfasts do not anchor in the sand, but attach to hard surfaces, typically rocks and boulders. The holdfast is not a nourishment supply line for the plant; it simply anchors the stipe to the substrate. Typically kelp thrives in water temperatures between 50 and 68 degrees Fahrenheit (10 and 20 degrees Celsius). It is nourished by nutrients supplied by the coldwater upwelling of deep-ocean currents. The depths at which kelp grows vary depending on water movement and clarity. Where the water is clearer kelp can anchor at 100 feet (30 m) or deeper. In waters where turbidity interferes with light reaching the fronds, kelp typically grows from a depth of 50 to 60 feet (15 to 18 m). Large stands of kelp create kelp forests, which are most prevalent in coastal waters fed by nutrient-rich currents. The Pacific coast of North America is one of the most diverse and exciting kelp regions anywhere. Kelp grows nearly two feet (61 cm) per day. Its primary threats are severe storms, whose heavy seas rip the holdfasts from their anchor, and overgrazing by sea urchins. The stipe and fronds that make up the forest often form a seemingly impenetrable surface canopy that can be up to five feet (1.5 m) thick; this creates a dark, dramatic subsurface environment. Kelp plays a significant role in the marine ecosystem. Marine life flourishes in and beneath the kelp canopy. Kelp diving is a magical experience, but it’s not without challenges. It is important that you are properly equipped and trained for kelp diving. The primary hazard is entanglement. The safest and easiest solution is to avoid getting snared by kelp. 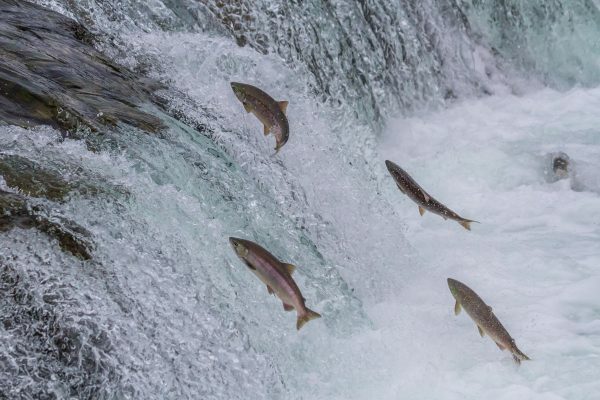 Streamlining is the first step toward avoiding entanglement. The fewer items protruding from you and your gear, the less likely you are to become snagged. Wear your knife where it does not protrude, keep accessory gear to a minimum and secure your gauge console and other items close to your body. Disorientation is another hazard. Finding your way into and out of a kelp forest requires solid compass and natural navigation skills. 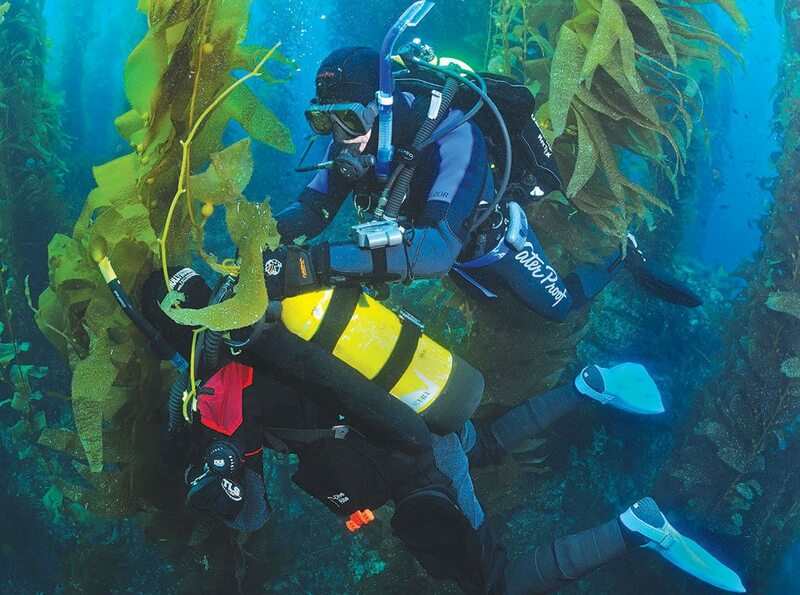 Kelp diving does not require special equipment other than a knife and/or cutting device and compass, which most safety-conscious divers carry anyway. A dive light is optional, but is absolutely necessary on overcast days and where the canopy is particularly dense. The snorkel is a bit controversial. In thick kelp it is prone to snagging and entanglement. However, if there is a significant distance to the kelp forest, as when diving from shore, a snorkel comes in handy to conserve air while surface swimming. Some experienced kelp divers are adamant about not using a snorkel, so a compromise is a fold-up snorkel that can be stowed in a buoyancy compensator (BC) pocket during the dive. Dive planning is an especially important part of kelp diving. Before you head for the site, find out everything you can about it. Better yet, the first time you dive a site do it as part of a dive center group familiar with the site. As a buddy team, devise a detailed plan that includes not only the profile and minimum air benchmarks, but strategies for descending and ascending, entering and exiting the kelp forest, compass routes, location of openings in the canopy, entanglement avoidance and resolution strategies. When diving from shore you might need to make a significant surface swim to reach the kelp beds. Do not attempt to tow your float and flag into the forest; instead, anchor it near the perimeter where you plan to descend and enter. Rather than attempting to navigate through the canopy on the surface, descend at the edge of the kelp bed and enter the forest at diving depth. If diving from a boat it most likely will be positioned so the stern is located near the edge of the bed. This makes it convenient to enter the water and make a vertical descent adjacent to the kelp. Avoid entering the water directly into the kelp canopy. Hopefully, you will be able to enter into an unobstructed surface adjacent to the canopy. Use the standard entry technique for the boat you are on. Make your way to the chosen descent location and submerge as a buddy team so assistance is nearby in case one of you becomes entangled. 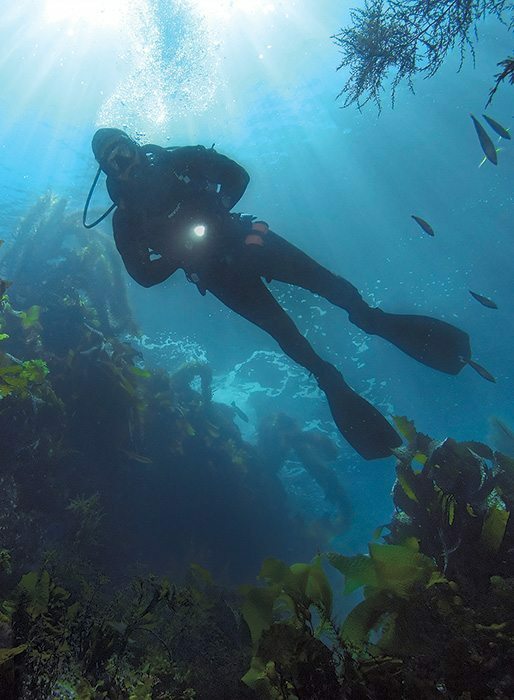 Although descending through openings in the canopy is possible, divers new to kelp diving should choose locations where they can descend outside the canopy or through a wide canopy opening, which typically is directly above a sandy bottom area where hold-fasts cannot anchor. When possible, descend and establish an underwater base at the edge of the forest before entering the kelp (Photo 1). If you descend through an opening in the canopy, the sand patch directly below also makes a good base from which to begin exploration of the surrounding forest. [ONE] When possible, descend at the outer edge of the forest before entering the kelp. The thicker the kelp bed, the more challenging it is to dive. Always swim beneath the canopy, as the area closer to the bottom generally provides easier navigation. One technique is to follow reciprocal compass legs into and out of the kelp. This reduces the risk of becoming disoriented and not being able to find your way back to the location where you can make a clear ascent. [TWO] When diving in kelp, stay beneath the canopy and combine natural navigation and compass navigation to enjoy exploring the kelp forest. While following a general compass course, pick the most unobstructed natural route (Photo 2). Swim neutrally buoyant and horizontal with your head raised to reduce the possibility of snagging your tank valve and regulator. Remain near your dive buddy. In narrow corridors, you may wish to move single file (Photo 3). [THREE] Remain near your dive buddy. In narrow corridors, you may wish to move single file. Manage your air supply conservatively when diving kelp. If inexperienced or unfamiliar with the site, plan to be back at home base — the edge of the forest where you entered, below the opening in the canopy where you descended or beneath the boat — with more than one-half of your air supply remaining. This provides an adequate safety margin in case of entanglement or difficulty finding the planned ascent location. If you lose your way in the kelp, look for an opening in the canopy where you can ascend and get your bearings. At the surface, take a compass heading to your planned exit location; then descend and swim beneath the canopy while following the heading. A dependable buddy is especially important when diving kelp, both to resolve entanglements and as a source of emergency air. Buddies should keep a sharp eye on each other to watch for entanglement. If you do become entangled, do not turn in circles. When you feel a snag, stop all activity and remain calm. If you can easily reach and resolve the snag yourself, do so. Otherwise summon your buddy; he or she is in the best position to see what needs to be done to get you untangled (Photo 4). [FOUR] Becoming snagged is a hazard while kelp diving. If you get caught, remain calm and seek your dive buddy’s assistance to resolve the situation. Sometimes resolving entanglement is as easy as removing a single stipe from your buddy’s tank valve. Other times it might require cutting and untangling multiple stipes. Stopping all activity as soon as you feel a snag and remaining motionless until your buddy comes to your assistance makes eliminating the entanglement much easier. The goal at the end of a kelp dive is to surface near where you initially descended. Hopefully, this is near the boat or where you have an unobstructed snorkel to shore (if shore diving). If you are at the perimeter of the forest you can make a normal ascent, using caution to avoid any stray stipes or fronds. When ascending through a wide opening in the canopy, raise one hand and ascend vertically. As you slowly ascend, your exhaled bubbles will help clear the fronds from your path. And don’t forget the safety stop. Ascending through the canopy may result in a challenging crawl through kelp on the surface. If you must ascend though a dense canopy, move very cautiously. Slowly rotate your body while pushing the kelp away with your hands. This creates a clearing for your tank and eventually an opening in the canopy. When you surface outside the canopy in unobstructed water, swim to the boat or shore exit location and use a standard open-water exit technique. If you surface through an opening in the canopy that is surrounded by dense kelp, your best option is the kelp crawl; instead of attempting to swim on the surface, crawl on top of the canopy. With the regulator or snorkel in your mouth, use both hands to push down on the canopy as you pull yourself forward (Photo 5). Although slow and physically demanding, the kelp crawl is effective for moving limited distances across a kelp canopy. Other techniques often result in entanglement. [FIVE] The easiest way to make your way on the surface is the kelp crawl. Rather than trying to swim, crawl on top of the canopy. Before thinking about an adventure into a kelp forest, a diver needs to possess thorough command of a number of basic scuba skills: buoyancy control (starting with proper weighting), air management, dive planning, compass navigation, boat diving (if diving from a boat), shore diving (if from shore), controlled descents/ascents and, equally important, the buddy system. 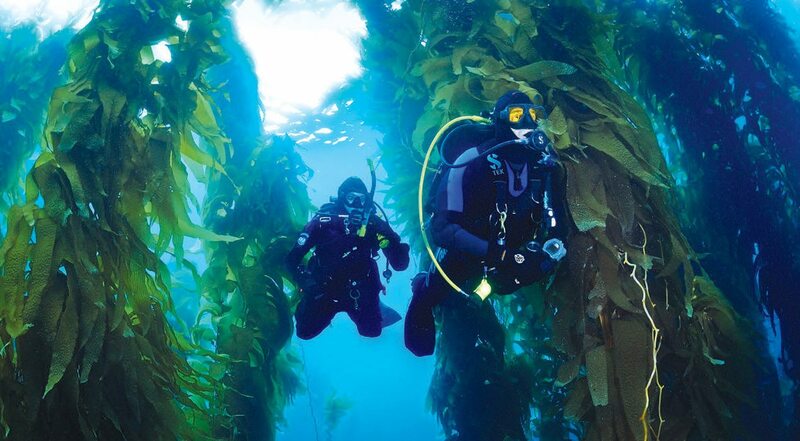 Learning to dive in kelp is best accomplished through a Kelp Diving specialty course, which typically is offered by dive centers that support divers who engage in the activity. A diver who has not before dived in kelp, regardless of diving experience, should proceed cautiously and dive conservatively. 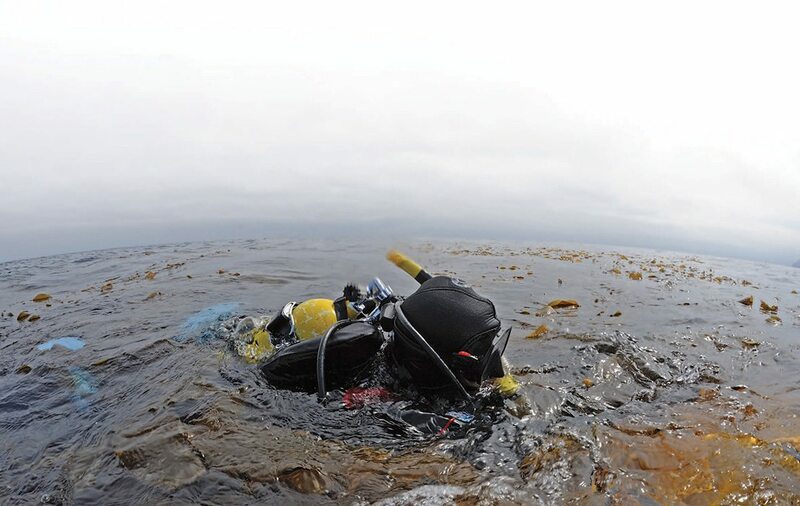 To avoid task overloading, until you are comfortable diving in kelp do not carry a camera system or other dive accessory that might divert your attention from the tasks at hand, and avoid combining learning experiences like your first dry suit dive and your first kelp dive. Keep safety first and enjoy your adventure beneath the canopy.